All political parties have been invited to this event, which is being organized by Rede ba Rai (Land Network). Land is a unique resource for Timor-Leste, especially for small and poor people, for whom land is a place to live, provides food, is culturally essential, and sustains their livelihoods. Access to land has created many problems since the Portuguese colonialism and Indonesian occupation, and recent proposed laws and development models could sabotage people's lives for economic reasons, turning land into a commodity. Rede ba Rai is organizing this debate, Oinsá Partidu Polítiku nia Polítika Atu Garante Povu Nia Direitu Asesu Ba Rai to help voters understand what each party and coalition plans to do about land during the next five years. Download Tetum invitation or flyer. Download the briefing as a 16 MB Powerpoint, or 3 MB PDF. Many of the observers and journalists coming for the Parliamentary elections have asked us for interviews, and we will meet individually when requested. In addition, we are offering this briefing to give people a quick, deep understanding of aspects of Timor-Leste’s current reality and future prospects. Non-journalists are welcome to attend. Some of this material is on La’o Hamutuk’s website and blog, including a similar briefing last May. The July briefing will primarily be in English, but we will provide information in Tetum. This map shows the location of our office, which is behind Dili Cathedral on the left side of the main road westward toward Bairro Pite. Thank you for your interest and participation. Please let us know if you plan to attend the briefing. For more election-related information, click here. Everyone knows that many people in Timor-Leste are impoverished -- and the rural poor know it far better than the economists and policy-makers in Dili and around the globe. Last week, at the UN Human Rights Council in Geneva, the world got a glimpse of Timor-Leste's reality. The UN Special Rapporteur on Extreme Poverty and Human Rights, invited by Government to visit here last November, discussed her findings with the Council and with people all over the world. 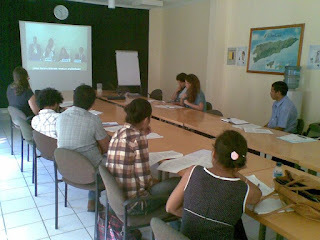 Here in Dili, civil society, Government and UN staff watched it via UN webcast (photo at right). La'o Hamutuk worked with three international NGOs to make written and video statements to the Council, supporting the Rapporteur's report and explaining that poverty here could get much worse in about ten years, when Timor-Leste's oil runs out, our youth population doubles and debt repayments escalate. For more information on the Special Rapporteur and Timor-Leste, including other documents, see http://www.laohamutuk.org/econ/SRPoverty/12SREP.htm. Timor-Leste's Government gave qualified support to the Rapporteur's recommendations: While certain premises in the report could have taken current reality of Timor-Leste into account, we appreciate the analysis and recommendations of the Special Rapporteur." In that regard, La'o Hamutuk encourages the Government to publish the results of the Household Income and Expenditure Survey conducted last year. According to the just-released Ministry of Finance Handover Report, "the recent Household Income and Expenditure Survey combined with others will yield new insights into poverty." Atu hare'e blog ida ne'e iha Tetum, hili iha ne'e. To support citizens’ participation in the election, La’o Hamutuk has published a pamphlet with questions for voters to ask each political party. You can download it as a Tetum PDF (or English) or find more information about the electoral process on La’o Hamutuk’s website. 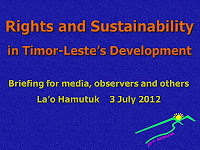 La’o Hamutuk is a Civil Society Organization which monitors and analyzes the development process. In July, you will vote for Members of the National Parliament. This process is a democratic path to determine your future and that of the next generation. The political campaign has already started, and we think that your participation will help future leaders to decide on good and appropriate policies for Timor-Leste’s actual situation.In addition to helping you understand each party’s program for the next five years, this will also help you vote wisely, according to your conscience. 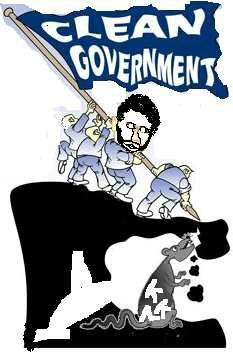 At present, half of our domestic economy and nearly all state activities are paid for with petroleum revenues. What policies will your political party undertake to continue state services and sustain people’s lives when the oil is used up and the Petroleum Fund is empty 12 years from now? At present, more than half of the state budget is spent on physical infrastructure, especially electricity. Only a little is allocated for human resources, like education and health. 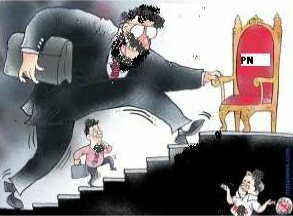 Do you think it is good to continue these priorities, or to develop the capacity of Timor-Leste’s people to carry the nation forward? Ten years from now, our youth population will be much larger, and unemployment may be higher than it is today. What policy will your party propose to help Timor-Leste deal with this program, and which human resources will you prioritize to develop this nation? Timor-Leste’s Government just began to borrow from overseas, and there is a plan to borrow much more to finance the National Strategic Development Plan. How can Timor-Leste pay back the debt, when our oil and gas is gone? At present, the Government prioritizes the Tasi Mane Project on the South Coast, which will rely on the Greater Sunrise gas field. 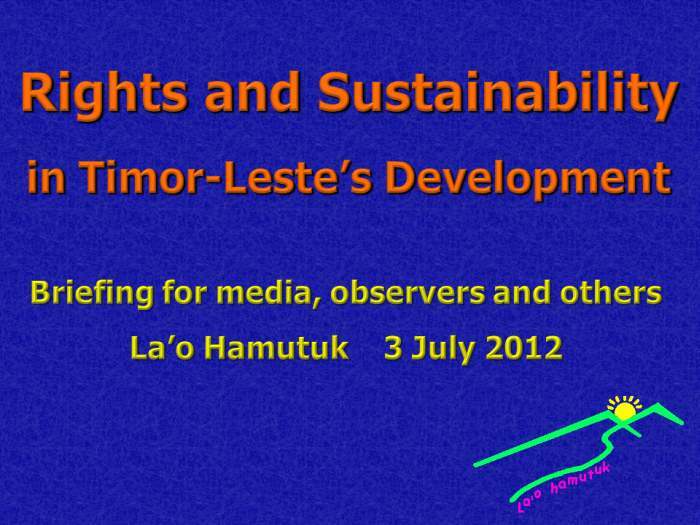 If we cannot bring the Greater Sunrise pipeline to Timor-Leste, what will underpin this project? What does your political party think about this investment or spending of the people’s money? If Government actually develops this Tasi Mane project, does your political party think that the project will provide work for many Timorese people, or benefit rich people more than the poor? What is your party’s approach to the participation of women and men in this project? During its illegal occupation, Indonesia killed nearly 200,000 people, and after independence impunity continues to prevail for Indonesian generals involved in crimes against humanity in Timor-Leste. Does your party think it is important for perpetrators to be brought to court? What will your party do to end this impunity? Timor-Leste has not yet ratified the International Convention for the Protection of All Person from Enforced Disappearance. Does your party think we should sign and ratify it? If so, how do you think we should implement this Convention? Corruption is an obstacle to development, especially in countries whose state budget depends on oil revenues, like Timor-Leste. What policies will your party propose to prevent corruption, including in Public Institutions and state-owned businesses? At present, Timor-Leste is trying hard to join ASEAN, but nearly all ASEAN countries supported Indonesia’s illegal occupation of Timor-Leste for 24 years. What will your party do to help stop human rights violations within ASEAN, such as in Burma and West Papua? Former President Ramos-Horta vetoed three laws about access to land, because he saw that these laws could violate the rights of ordinary people. What will your party’s policy be to protect and ensure small people’s rights to access land? What policy will your party propose to develop a productive, sustainable economy, such as agriculture, to reduce our economic dependence on exporting nonrenewable resources? How will you reduce imports of food and basic necessities, so that Timor-Leste can achieve economic and food sovereignty? To see this blog entry in English, click here. Atu lee resposta husi partidu politiku balun, hili iha ne'e. Atu apoiu sidadaun sira nia partisipasaun iha eleisaun, La'o Hamutuk foin publika pamfletu ida ho preguntas eleitor sira bele husu ba kada partidu polítiku. Bele download iha ne'e hanesan PDF, (mos Ingles) ka hetan informasaun tan kona ba prosesu eleisaun husi LH nia website. La’o Hamutuk nudár Organizasaun Sosiedade Sivíl ne’ebé monitor no analiza prosesu dezenvolvimentu. Iha Jullu ita-boot sira sei hili Deputadu/a sira iha Parlamentu Nasionál. Prosesu ne’e nudár dalan demokrasia atu determina futuru ita-boot sira no jerasaun futuru. Daudauk ne’e prosesu eleitorál ba kampaña polítiku la’o hela, ami hanoin partisipasaun ita-boot sira sei ajuda futuru ukun-na’in sira atu deside polítika ne’ebé di’ak no apropriadu ba kontextu reál Timor-Leste. Aleinde atu ajuda ita-boot sira hodi komprende kada partidu nia programa iha tinan lima oin mai, no mós bele ajuda hodi vota tuir konsiénsia no matenek. Nune’e ami distribui perguntas atu ajuda ita-boot sira hodi partisipa ba prosesu kampaña diálogu. Eleitores sira bele utiliza kada perguntas hodi husu ba partidu polítiku sira durante sira hala’o sira nia kampaña iha fatin ne’ebé de’it. Daudauk ne’e, metade ekonomia rai laran no mós besik atividade estadu nian tomak finansia husi reseitas petrolíferu. Polítika saida mak ita-boot nia partidu polítiku sei halo atu kontinua servisu estadu no sustenta povu nia moris bainhira mina-rai maran no Fundu Petrolíferu sai mamuk iha tinan 12 tuir mai? Daudauk ne’e, liu metade orsamentu estadu gasta ba infrastrutura fízika, liu-liu eletrisidade. No aloka uitoan de’it ba rekursu umanu, hanesan edukasaun no saúde Ita hanoin di’ak atu kontinua prioridade hanesan ne’e, ka atu dezenvolve kapasidade povu Timor-Leste atu lori nasaun ba oin? Tinan 10 tuir mai, númeru populasaun joven sei sa’e maka’as, no dezempregu bele aumenta kompara ohin loron. Polítika saida mak ita-boot nia partidu polítiku sei trasa atu ajuda Timor-Leste hodi bele enfrenta problema ne’e, no rekursu umanu saida mak ita-boot nia partidu polítiku sei prioritiza atu dezenvolve nasaun ida ne’e? Governu Timor-Leste foin hahú atu empresta husi rai li’ur, no iha planu atu empresta barak liu tan atu finansia Planu Estratéjiku Dezenvolvimentu Nasionál. Oinsá Timor Leste bele selu fali tusan, bainhira mina no gás hotu ona? Daudauk ne’e Governu prioritiza mós projetu Tasi Mane iha Kosta Súl ne’ebé sei sadere ba kampu gas Greater Sunrise. Karik kadoras Greater Sunrise labele lori mai iha Timor-Leste, projetu ne’e atu sadere tan ba saida? Ita-boot nia partidu polítiku nia hanoin katak ne’e investimentu ka sei gasta de’it osan povu nian? Karik Governu dezenvolve duni projetu Tasi mane ne’e, ita nia partidu polítiku nia hanoin katak projetu ne’e sei fó servisu ba ema Timor barak? ka benefísiu de’it ema riku sira duke ema kiak? Oinsá ita nia Partidu nia aproximasaun kona-ba partisipasaun feto ho mane iha projetu ne’e? Durante okupasaun ilegál Indonézia ne’ebé oho ema besik rihun atus rua hafoin ukun-an impunidade nafatin prevalese, ba Jenerál sira iha Indonézia ne’ebé envolve iha krime kontra umanidade iha Timor Leste, karik ita-boot nia partidu polítiku hanoin ne’e importante ba autór kriminozu sira atu ba hatán iha Tribunál? Polítika saida mak ita nia partidu sei halo atu hakotu impunidade ne’e? Daudauk ne’e TL seidauk ratifika Konvensaun Internasionál ba Ema Lakon (International Convention for the Protection of All Person from Enforced Disappearance), ita boot nia partidu polítiku hanoin ne’e presiza atu ratifika? Karik hakarak ratifika, oinsá atu implementa konvensaun ne’e tuir ita-boot nia partidu polítiku sei prefere? Korrupsaun nudár obstákulu ba dezenvolvimentu, liu-liu iha nasaun ne’ebé nia orsamentu estadu depende ba reseitas petrolíferu hanesan Timor- Leste. Polítika saida mak ita-boot nia partidu polítiku sei trasa atu prevene korrupsaun, inklui iha Institutu Públiku no Empreza Públiku iha Timor-Leste? Daudauk ne’e Timor-Leste esforsu an atu tama ba iha ASEAN maibé iha parte seluk, besik hotu membru ASEAN apoiu okupasaun ilegál Indonézia iha Timor- Leste durante tinan 24. Saida mak ita boot nia partidu polítiku sei halo atu ajuda hapara violasaun direitus umanu iha ASEAN laran hanesan iha Burma no Papua Barat? Eis Prezidente Ramos-Horta veto ba lei tolu kona ba asesu ba rai tanba nia hare lei hirak ne’e bele viola direitu ba povu ki’ik. Oinsá ita boot nia polítika partidu ninian atu proteje no asegura direitu povu ki’ik sira hodi asesu ba rai? Polítika saida mak ita nia partidu sei trasa atu dezenvolve ekonomia produtivu ne’ebé sustentável, hanesan agrikultura, atu hamenus dependénsia ba ekonomia husi esportasaun rekursu naun-renovavel? Oinsá ita nia polítika partidu nian hodi hamenus importasaun ai han no nesesidade báziku atu Timor-Leste bele atinje soberania ekonómiku no ai han?